The Darkness II is the sequel to the critically acclaimed 2007 release The Darkness. 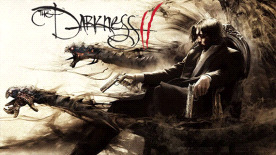 Inspired by the popular comic book series produced by Top Cow Productions, Inc., The Darkness II is an intense first person shooter that puts you in the role of Jackie Estacado, don of a New York crime family and wielder of an ancient force of chaos known as The Darkness. It's been two years since Jackie used his power to kill the men responsible for his girlfriend's murder. He's been unable to shake the memory of Jenny's death since bottling up The Darkness and now it wants out. A botched attempt on Jackie's life opens the door for The Darkness to reemerge, and sets Jackie on a brutal and personal journey as he unravels the mystery behind the attack and the motives of The Darkness. Slash, grab, and throw objects and enemies with the Demon Arms while simultaneously firing two weapons, adding a new dimension to the FPS category. Master the Demon Arms and summon the powers of The Darkness for even more explosive gameplay. The vicious powers of The Darkness manifest only in the shadows so use the environment to your advantage and watch out for enemies who will use light as a weapon. Experience a dark, twisted and gripping story written exclusively for the game by acclaimed comic book author Paul Jenkins whose credits also include The Incredible Hulk, Wolverine, and the original The Darkness game. Graphic novel shading and color combined with the dramatic lighting of film noir pays tribute to the source material and brings the pages of the comic series to life. Inspired by the popular comic book series created by Top Cow.